The dream of peace in the Middle East between Israelis and Palestinians was shattered in 1995 with the assassination of Israeli Prime Minister Yitzhak Rabin. What remains of that hope for peace? In 1994, Amos Gitaï decided to follow from behind the scenes the peace negotiations between Israeli Prime Minister Yitzhak Rabin and PLO leader Yasser Arafat which led to the Oslo Accords. Yitzhak Rabin was adamant that you have to negotiate with your enemies. The global community breathed a sigh of relief, while Israeli and Palestinian hardliners raised their voices in protest. On the evening of November 4, 1995, Rabin was taking part in a peace rally in Tel Aviv, where he held a moving speech about reconciliation. As he stepped down from the podium, he was assassinated by a Jewish religious fanatic and law student, Yigal Amir. More than 20 years later, Amos Gitaï is looking at what hopes of peace remain. In Israel, the US, and elsewhere today, there are politicians who do not recognize the borders of 1967. And the building of Israeli settlements on the West Bank is creating a fait accompli that is not legitimated by international law. Nevertheless, there are still those who insist that the conflict must be resolved peacefully. The filmmaker of ‘A Moment of Optimism’ gives a voice to Israelis and Palestinians who even today believe in dialogue and peaceful coexistence. The video was first published to YouTube on 13 May 2018. 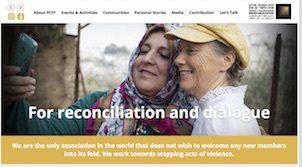 At 23m 12s in the video is a 3-minute segment about the Israeli-Palestinian Parents’ Initiative in Best Jala, West Bank — a gathering of women who have lost children to violence and conflict. Learn more about similar efforts by visiting TheParentsCircle.org.